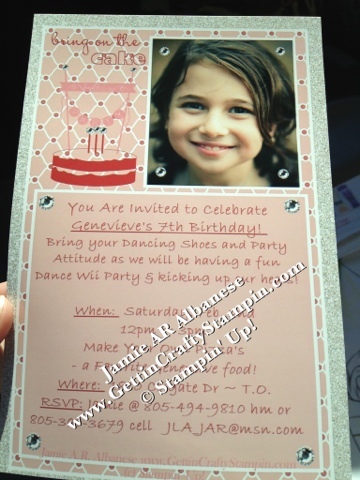 Getting Crafty with Jamie: Sparkle Birthday Invites! I ADORE how EASY My Digital Studio is!! (especially during my hubby's busiest season at work and w/ taxes in our own company!). But, with My Digital Studio (MDS) it's easier than ever to create a Birthday Invitation (and thank yous, decorations, etc) with a few swipes of my fingers and then I can order it for 1 hour pick up at a local photo processing center. 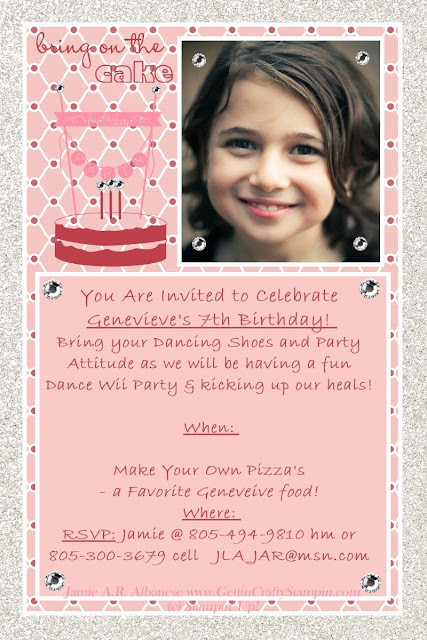 My Genevieve is turning 7! WOW!! This is actually ON her Birthday and we've always combo'd her and her brother's birthdays (they are two years and two weeks apart) but last year we had over 50 kids and several adults at a pizza tour and party... it was a TON to tackle. This year my frilly, sassy and girly girl wanted to do a girly party (not that I can blame her). With the Release of Stampin' Up! 's Glimmer Paper on MDS (can you imagine how EXCITED I am?!?! lol) I created this blinged out card! Being that she has to select only a few friends, I can email their moms as well as we printed this at my local pharmacy (I can pick it up on my way to her school - how COOL!) to hand out with the follow up email (in case any girl loses the invite). Bling and Stamps - Glimmer and Designer Series Paper, the Rhinestones, adding layers and text... it's a mom's dream! I'll coordinate the party decorations and thank you's with the ease of MDS and the fact that it matches our current papers! What would YOU Create with My Digital Studio?!?! I can easily take all of our photos and scrapbook them after the party... how great is that?!?! Thank you for coming by, taking a look and feel free to share and leave a comment, it is always appreciated!